The United Arab Emirates has appointed its first female government minister. Sheikha Lubna al-Qasimi, a member of the Sharjah royal family, is to take on the key job of economics and planning minister. The move comes as a part of a wider government reshuffle and the merging of three ministries. There are other women ministers in Gulf countries, in Bahrain, Oman and Qatar, but Sheikha Lubna's role is the most senior to date. For many young Emirate women, Sheikh Lubna al Qasimi is already a role model. Educated at a US university, she's gregarious and approachable as well as still being traditional enough to wear the black abaya and shayla robes of most Emirate women. Sheikha Lubna has had a meteoric rise through the male dominated government and business ranks of her country. Her background is in information technology rather than economy but her personality suggests she'll take a hands-on role as the country's first female minister. Other changes among the federal ministries indicate some streamlining as well as the appointment of more members of the royal family. It's extremely difficult for critics to question the actions of the sheikhs belonging to the Emirates ruling families. There is no elected representation in the UAE at all. 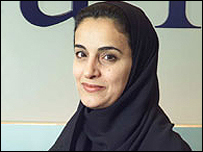 Sheikha Lubna is a member of the Sharjah Emirates royal family, but is seen very much as Dubai's candidate for this job.